Had as much luck getting this installed as Skywave. Live works but installer crashes. Tried both live and direct installers. Tried it myself used in vm . gsm search gui doesnt work ,with line grgsm_scanner in terminal it works as reported. 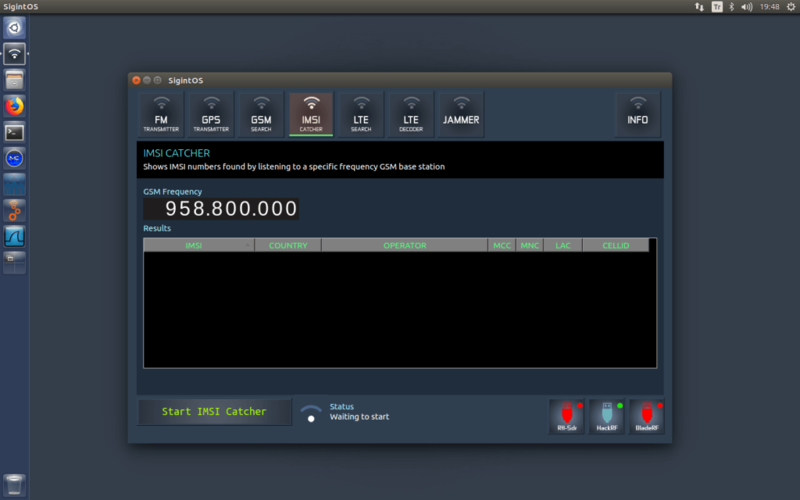 Imsi catcher works ,gqrx works sdrangel works ,also wireshark and gnuradio. wxtoimg have not tried it. I think its a great tool they have made. Hopefully they go on and perhaps they put more tools in it like tetra or dect ,that would be great. Does Kali Linux contain most of these tools? I haven’t looked in about 2 years. Seems a majority… though I didn’t really get into. Somewhat like Skywave and Andy’s Linux too with some additional custom tools. Wonder what an itemized list of applications of the different versions of Linux noted in the comments looks like? try parrot-os… some rtl sdr tools preinstalled. On Twitter others have had trouble with the GUI based GSM search too, but they found the grgsm_scanner command line tool which is also preinstalled works. Nice! However I think PlutoSDR support is must have (I’d volunteer to test it if the author doesn’t have PlutoSDR).